We hope you will join us to celebrate the Tibetan New Year, the Year of the Iron Rabbit! Please note: concert only tickets are not available through Tibet House US. Benefit package tickets including concert tickets and entrance to a post-concert dinner party with the honorary chairs and artists are available now online at Brown Paper Tickets. Carnegie Hall is located at 881 Seventh Avenue (at 57th Street). Over the last week, I have received quite a few calls and emails from people wondering whether the Festival of Tibet is still on. 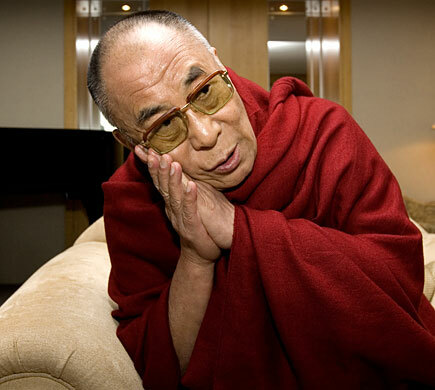 I would like to reassure everyone that despite the Brisbane Powerhouse experiencing some flooding, it has been cleaned up and the Festival of Tibet is definitely going ahead in high spirits from 3 – 5 February 2011. Please come and support. Whist challenging, the difficulties we facing in the lead up to the Festival of Tibet are extremely minor compared to the devastation experienced by so many of my fellow Queenslanders. Much assistance is needed still, so please visit http://www.qld.gov.au/floods/ to see how you can help. Festival of Tibet is announcing that all the proceeds from TIBET: Awakened Heart concert will go towards the Flood Relief. So, please book your tickets to help our fellow Qlder’s. Mystical TIBET Concert Chants and Tibetan Gypsies Melodies with Tenzin Choegyal, Jamyang Dolma and collaboration of Tenzin with Camerata of St. John’s chamber orchestra to create a musical potion. 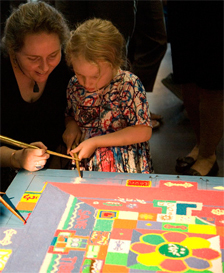 Many free events suitable for all ages including the creation of the Sand Mandala for Peace happening throughout the Festival. To download the PDF version of the festival postcard and full schedule please click below. Do you have a taste for the exotic but can’t afford a world trip? That’s ok. We’re bringing the world to you. Join Dva (Linsey Pollak and Tunji Beier) as they host our first Planet of 2011, they will be joined by Taro Terahara and Shen Flindell. Taro Terahara is great command of sur (tuning) and lay (timing), with the ability to compose innovative taans and tihais on the spur of the moment. His music both engages the mind and touches the heart. Shen Flindell has grown to become one of Australia’s leading tabla players, and is also very active in the thriving Indian music community of Japan. He is best known for his beautiful sound and supportive accompaniment. They both to take you on a spiritual journey to start the year. Tibet2Timbuk2 is an award winning fusion of African, Indian and Tibetan sounds which transcends cultural boundaries. Rollicking Tibetan folk, afro-reggae guitar grooves and intricate Indian tabla sound as if they were made for each other! Together, Tenzin Choegyal, Marcello Milani and Shen Flindell take audiences on a journey from the joyous to the meditative and back. With guest artist Taro Terahara, master Bansuri (Indian classical flute) player and Jamyang Dolma a renowned Tibetan female Vocalist. Jamyang Dolma was born in Kham in the east of Tibet. Her family were farmers and she learnt traditio nal mountain songs and epic stories from her grandmother. In 1985 she left the difficult situation in Tibet and arrived in Dharamsala in northern India where she joined the Tibetan Institute of Performing Arts. She has performed extensively in Europe. She has performed solo in television appearances in Japan and concerts in Paris and London. She also participated in the filming of “Kundun”, the Martin Scorcese film about the early life of His Holiness the Dalai Lama and her songs were featured in a documentary about the making of this movie. Her powerful voice expresses the traditional culture and beliefs of the Tibetan people with emotion and spiritual affinity. Jamyang’s songs include prayer chants, traditional folk songs from eastern Tibet and songs from the King Gesar epic, a famous ancient Tibetan tale. She is very happy to sing for you today. The Mystical Tibet Concert creates a perfect musical potion through the combination of Brisbane’s Camerata of St. John’s chamber orchestra, Tenzin Choegyal (Tibet), Jamyang Dolma a beautiful female Tibetan singer and Taro Terahara (Japan). Taro is a master bansuri (Indian classical flute) player and disciple of bansuri master, Pandit Hariprasad Chaurasia. Tenzin’s expressive vocals and musical talents draw on his Tibetan traditions and he creates original and authentic musical compositions which express his devotion to his cultural lineage. Join Neljorpa Pemsi (Tibetan Yogi) Dzogchen practitioner for a morning meditation. Practicing meditation which calms the mind involves the elimination of inner and outer distractions and overcoming afflicting emotions. In a state of calmness the mind is capable of achieving equanimity, peace and clarity and with practice the potential for these capacities is limitless. The ultimate purpose of meditation is to understand and experience the true nature of our mind. There are many methods used by different religions, with breathing practice being one of the most effective. This session will offer a general understanding of effective breathing meditation which creates a mind which is stable, calm, alert and clear. 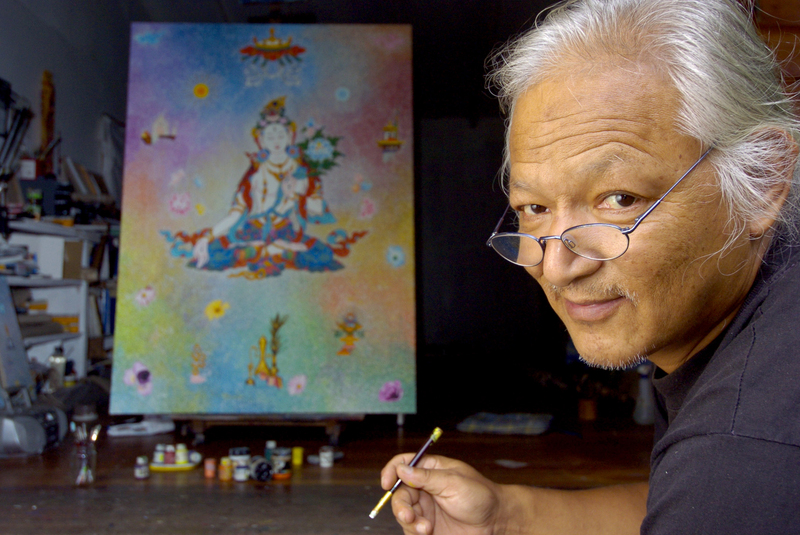 Spend some time with master painter Karma Phuntsok and learn some simple techniques used in Tibetan Painting. The art of Karma Phuntsok is a unique and dynamic expression of contemporary Buddhist Art. 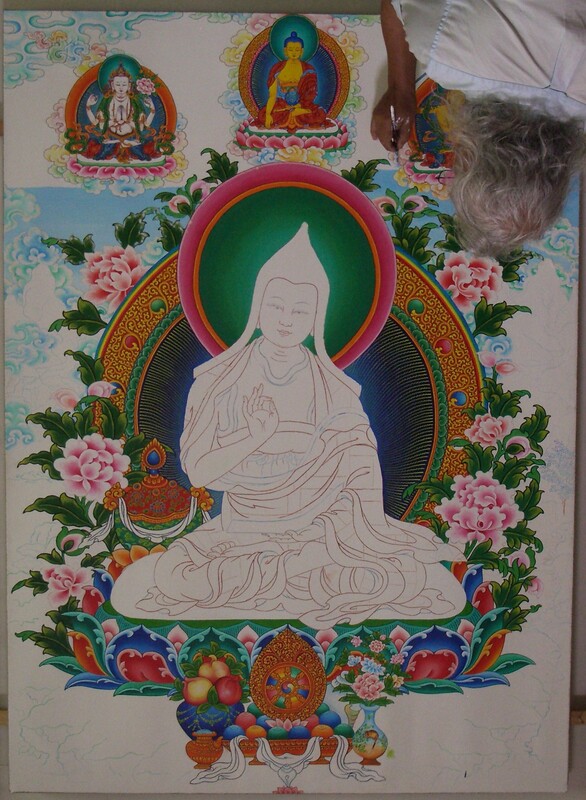 The startling beauty and richness which graces his work is influenced by his diverse life experiences: from a childhood in Tibet under Chinese oppression to life as a refugee in India; his love of life in the Australian bush, and the veneration with which he holds His Holiness the Dalai Lama. Internationally acclaimed, Karma’s work is scattered throughout the world, in private collections and galleries, and in Australia at the Art Gallery of New South Wales and Queensland Art Gallery. Join Mr Sonam Dhakpo, Representative of His Holiness The Dalai Lama in Australasia, Neljorpa Pemsi, traditional Tibetan Healer, Mr. Tenzin Norbu, Head of the Environment Desk, Tibetan Government in Exile, India and Geshe Lobsang Jamyang from Chenrezig Buddhist Institute, for an entertaining and informative discussion about Tibetan approaches to healing. Meditation, use of medicinal herbs, incantations, mantras and blessings are still used by Tibetans to address a variety of physical and psychological ailments. The panel will discuss the application and effectiveness of these traditional methods and their appeal around the world. Geshe Lobsang Jamyang was ordained at the age of sixteen and after eighteen years of study attained the highest degree in Buddhist Philosophy. Geshe la was a member of Sera Je Monastery in South India for many years and has also spent time studying at Gyume Tantric Monastery where he mastered practice and rituals of the tantric tradition. 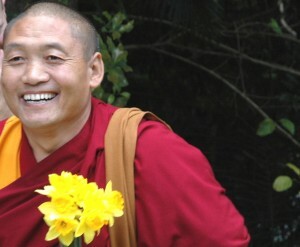 Geshe Jamyang joined Chenrezig Buddhist Institute on the Sunshine Coast in 2005 and is the resident teacher. Mr. Tenzin Norbu was born in India and went to TCV school. He completed his Bachelor’s degree in Science and Education from India. He served TCV school for 5 years as a Science and Math teacher. He also worked as a research associate at Asian Institute of Technology (Thailand) for over 5 years after earning his Master’s degree in the field of Environmental Technology from the same Institute. He is now serving (since Dec 2008) at the Central Tibetan Administration at Dharamsala in the Environment Desk under the Department of Information and International Relations. Since then, he has participated in various regional and international conferences (COP 15, APGN 2010…) raising issues related to the environmental situations and concerns on the Tibetan Plateau. 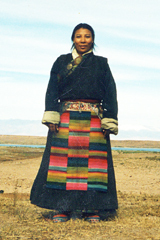 Widely known as “Mother of Tibet”, Ama Jetsun Pema is the former President of the Tibetan Children’s Village School (responsible for educating thousands of Tibetan refugee children), the first female Minister in the Tibetan Government-in-exile, UNESCO Medal Winner and younger sister of His Holiness The Dalai Lama. Don’t miss this rare opportunity to hear Jetsun Pema la talk about her life long commitment caring for children in the exile community on this, her first ever visit to Australia. Mr. Tenpa Tsering, The Chief Representative of His Holiness, the Dalai Lama will join Jetsun Pema on stage. ‘Others before self: educating children in exile’ and WHY TIBET ? Sandy McCuthcheon with be moderating this “In Conversation with Ama Jetsun Pema and Mr. Tempa Tserin g”. Sandy McCuthcheon is one of Australia’s great treasures. As presenter of Australia Talks Back on Radio National, he probably knows better than anyone how Australians think and what’s important to them. He’s not only a broadcaster – he’s also a highly acclaimed playwright, novelist and poet.